As spring approaches, it is a fun time to play with bugs! 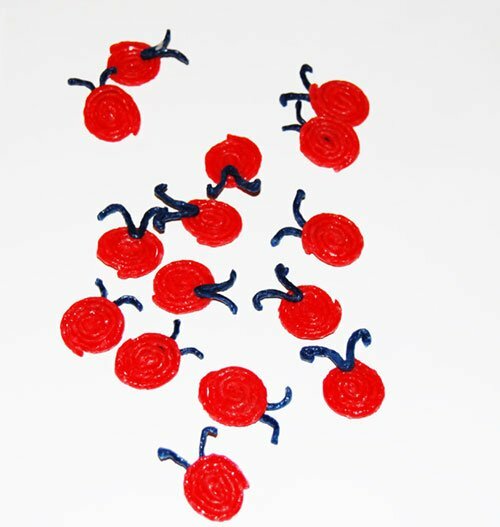 The Wikki Stix ladybugs are great crafts to enhance developing fine motor skills, but the created ladybugs also make perfect math counters for playful learning! We hope your own Preschool and Kindergarten kids will enjoy creating, playing, and learning with ladybug math! Set out all the supplies below as an invitation for your own kids to create! Scissors (Wikki Stix can be easily cut with safety scissors and will be a new texture to practice emerging cutting skills). Invite the children to begin on one end of a red Wikki Stix and create tight pinwheels (spirals) by wrapping the Wikki Stix around itself to create the ladybug’s body (see photo). The antennae are created by cutting a black Wikki Stix into thirds and forming a /V/ shape to press on top of the red ladybug’s body. Have the children make 20 ladybugs or assign small groups a number of ladybugs to create for math counters. Prior to play: print the ladybug math mat for each child and laminate for durability. One-to-One Correspondence: invite the kids to roll the die and place the corresponding number of Wikki Stix ladybugs on top of the math mat. It’s a great way to play and learn with one-to-one correspondence. Addition: invite the kids to roll the die and place the corresponding number of ladybug counters on the left side of the math mat. Have them roll the die again and place the corresponding number of ladybug counters on the right side of the math mat. Count the total number of ladybugs for simple addition practice. Subtraction: set a pre-determined number of Wikki Stix ladybug counters on top of the printable ladybug math mat. Invite the kids to roll the die and TAKE OFF the corresponding number of ladybugs from the mat. The game is over when all the created ladybugs have been removed. Greater Than/Equal To/Less Than: set a predetermined number of ladybug counters on each side of the ladybug math mat. 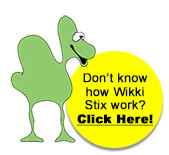 Invite the children to create the sign (<, =, >) that applies with cut pieces of Wikki Stix. 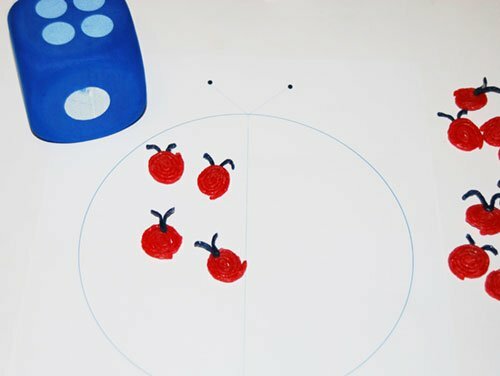 Plus 1 or Plus 2: have the kids roll the die one time and place that number of created ladybugs on top of the printable ladybug math mat. To do mental math, invite the kids to add (+1) or (+2) to the number of ladybugs on the mat. To self-check, have the kids add one or two more ladybugs to the math mat and then count the total number of bugs on the mat. Skip Counting: practice counting up by 2’s and 5’s by placing the corresponding numbers of ladybugs on top of the math mat. Making a number line (1-20) will help kids have a visual when beginning skip counting skills. Subitizing Skills: place a predetermined small number of created ladybugs on top of the math mat. See if the kids can tell how many counters are on the mat without counting the individual bugs. 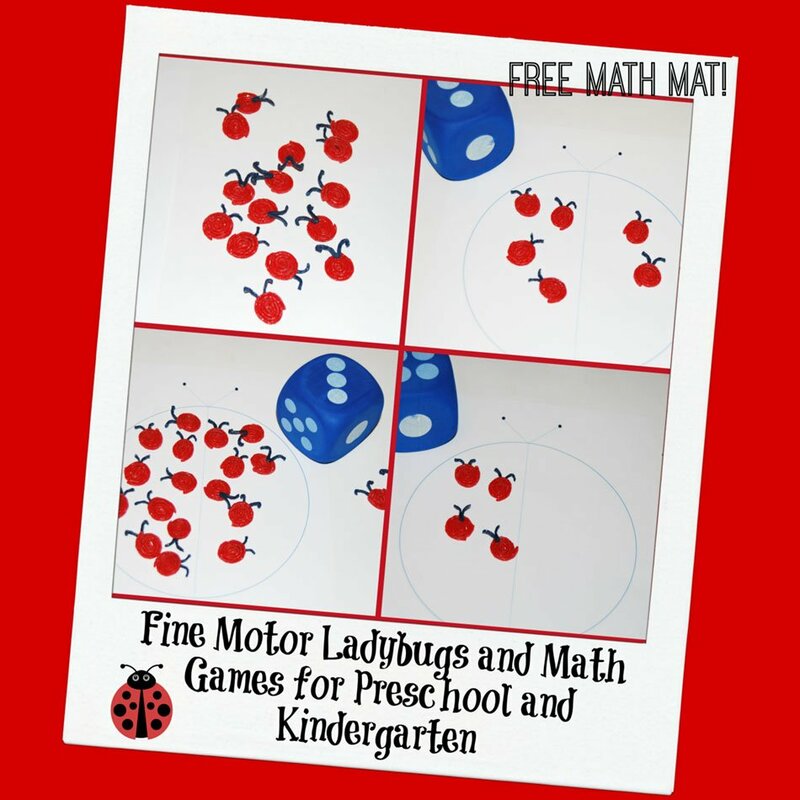 Print the 5 and 10 Frames for further practice with the created fine motor ladybug counters. The ladybug math mats and created Wikki Stix fine motor ladybug counters can be kept indefinitely! The games are FUN and make wonderful learning opportunities for playful math during the spring (or any time of year)!